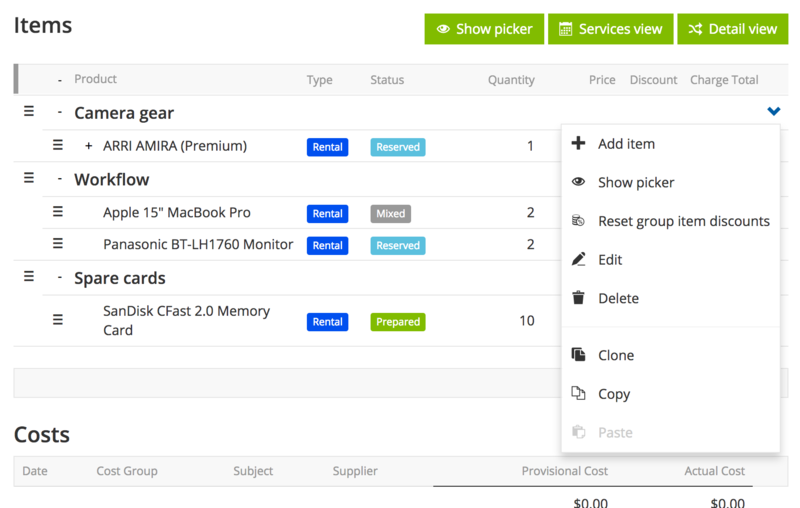 The picker is great for building your items list really quickly, but if you’d like to supply a little bit more information about products and services as you’re adding them then you can use the “Add new opportunity item” screen. 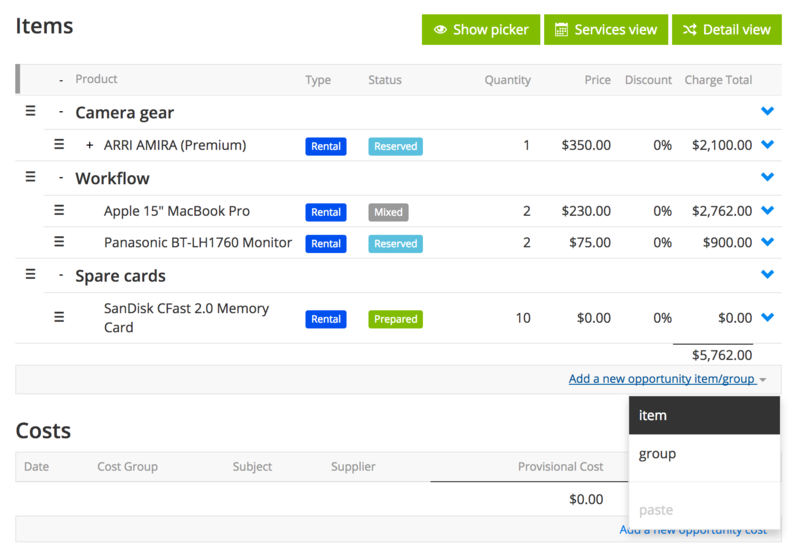 To add products and services, click add new opportunity item/group at the bottom right of the items list and choose item, or press ctrl + alt + i . Make sure the “Product/Service” radio button is selected at the top and start typing the name of your product in the Name box. Current will auto-suggest a list of your products and services as you type. If you hold both rental and sale stock for this product, change the transaction type here to specify whether you are renting or selling this item. Quantity of stock to add to the opportunity. 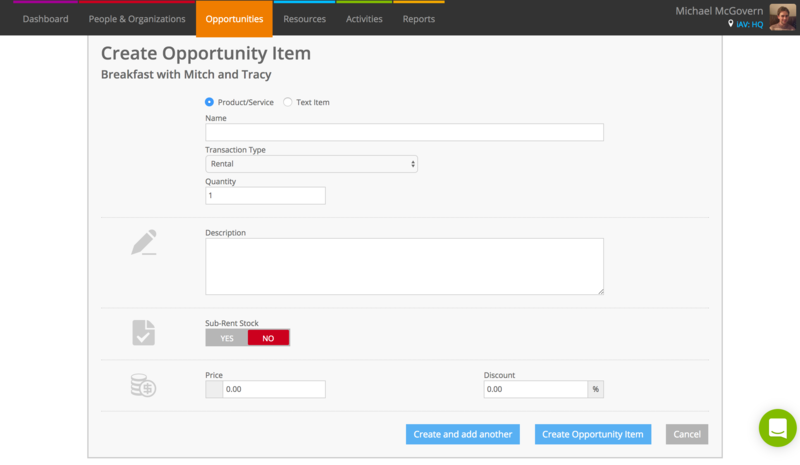 Add an opportunity item description. This will show up underneath the product in the order view in Current RMS and shows up on most of our default quotation layouts. Toggle the sub-rent or sub-contract toggle to YES to specify that you’re sub-renting or sub-contracting this service. Current will pull through the rate you entered against this product, along with the rate period so you can see if the price is daily, weekly, fixed, or any other period. Modify the price of this item here. Changing the price here affects only this opportunity. Choose the cost rate type, rate quantity, and price for your items. If a product has accessories, an “Accessories” section appears where you can add and change accessory quantities. For more bespoke opportunities, you may wish to create your opportunity groups first and then add products directly to these groups. For example, if you’re quoting for a conference with multiple rooms, create groups for each room, then drop items directly into those groups. To add items directly to opportunity groups or products that are already created, click the blue drop-down arrow to the right of a product and select show picker or add item. The process to add items using is the same as above. Can I add one-off products? My products aren't showing up as available to add, why? For rental products, have you added a rental rate? Did you select the correct transaction type in the picker? Is the product marked as “accessory only” or not active? Check out our troubleshooting article for more help on this: Why can't I add products to an opportunity?